All alone she sat–a runaway–heart pounding with fear. This was not the way she imagined events would unfold. Just weeks before opportunity had blossomed with possibilities–a life of security, provision, and honor seemed assured . But those dreams dissolved in a moment. If only I’d kept my mouth shut, she thought. What a fool to think I could get away with those snide remarks. But my mind was consumed with the unfairness of it all, and I was so jealous—jealous that she would hold the place of honor, not me. To her I was nothing more than a vessel. Fresh anger quieted her fear for a moment, as Hagar replayed the events that led her to sit by a spring in the desert, beside the road to Shur. When Sarai, her mistress, had first suggested she become a substitute wife to Abram, Hagar foresaw a better life for herself. Surely the mother of the master’s son would hold a secure position in the household. She would be well provided for and respected by everyone. But then the full meaning of “substitute wife” became clear. Hagar realized the child within her would not be her own but Sarai’s. Hagar began to express her frustration and jealousy toward Sarai in spiteful, unkind ways. She couldn’t seem to help herself. Finally, Sarai hit her and Hagar ran. Now what? Returning to Egypt seemed the only option. Her desperate hope was to find a home in need of a servant girl—even if she was pregnant. Hagar shaded her eyes and peered down the road, willing a caravan to come along. If she attempted to cross the desert alone, it would mean certain death. Instead of a caravan, however, a man approached. Little small talk ensued; he gave her an instruction (“Return to your mistress and do as she says.”); and he gave her a promise (“You will have a son, and descendants too numerous to count”). It wasn’t until the stranger left that Hagar realized she had been visited by the angel of the Lord, and she named the place, Beer Lahai Roi, “Well of the Living One who sees me” (Genesis 16:1-14). Imagine. A servant girl in a foreign country, completely alone and pregnant. She herself had compounded her troubles. Yet God sought her out, to instruct and encourage her. The Good Shepherd has always sought–and always will seek after–his lost sheep. And still today, our God is the Living One who sees us with the same love, grace, and mercy. He understands our situations, motives, and reactions (Psalm 139:1-4). He cares passionately about what happens to us (Psalm 103:13-14). He mercifully forgives our sins and refuses to even remember them (Isaiah 43:25). He instructs us in the way we should go (Psalm 32:8). He provides for our needs (Romans 8:32). He offers hope for our future (Jeremiah 29:11). 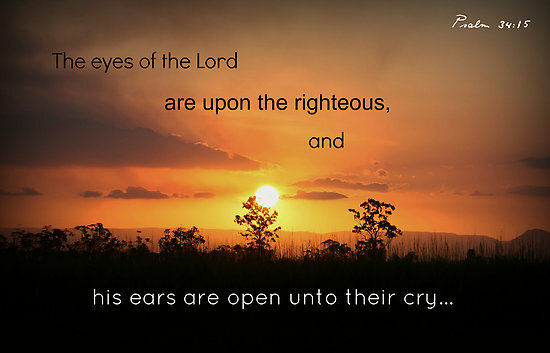 I praise you, Heavenly Father, that your eyes are upon the righteous—not because of any godly deeds we might accomplish, but because you see us through the righteousness of Jesus. And, oh how I thank you that you don’t just see us, you are watching over us. In these troubling, fear-inducing times, we turn our eyes upon you, our sovereign God, our refuge. Thank you, JD. The reassurance never grows old: “O the deep, deep love of Jesus…He loveth ever, changeth never…Watches o’er his loved ones, died to call them all his own” (from an old hymn). on November 16, 2015 at 6:03 pm | Reply SHUTTHATNEGATIVENOISEOFF! Beautiful and written very well. I’ve always loved this particular name of God. 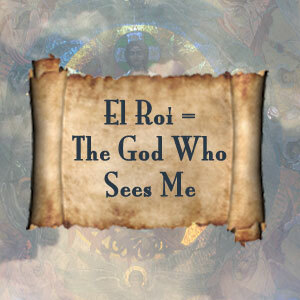 The God Who Sees Me. Beautiful! I like how you point out that He didn’t reprove Hagar here for her actions. The fact that He is so kind, so merciful, and so loving that He draws us to His righteousness through love, rather than reproach…well, for this former bad girl, that is precisely what makes me love Him so much! I, too, have been drawn to this name of God. It’s such a comfort, isn’t it? So glad I could remind you today of his love for you. Beautifully done. Thank you, Nancy. Thank YOU, Nikki, for your encouragement! A wonderful recap of everything He does for us. He understands us, forgives our sins…refusing to remember them! What a God! What a Savior! Feeling so blessed after reading this. Praise God! What a blessing for ME the he used the post to bless YOU! Thank you, Cheri. What a good reminder today, friend, that He sees ME…. It is a tremendous comfort, isn’t it? Thank you, Jean. So appreciate your encouragement!